Every year, millions of gallons of hydraulic fluid are lost – leading to contaminated work areas and cost overruns. Hydraulic equipment cannot operate correctly if fluid levels are low and are not meeting manufacturers’ specifications. If hydraulic leaks persist, equipment will be at risk of mechanical failure. This inevitability leads to costly downtime repairs and production losses. OIL-GLO® provides a quick and easy solution for finding every single leak. Simply add a small, concentrated amount of OIL-GLO® to the equipment’s hydraulic fluid reservoir. OIL-GLO® mixes with the hydraulic fluid and circulates throughout the entire system. The dye will escape with the hydraulic fluid wherever a leak exists. Before and After. All Leaks Found. Drag the interactive slider below. Fluorescent dye detects all system leaks. OIL-GLO® dye fluoresces brilliantly when exposed to violet or ultraviolet light. A technician simply must scan the hydraulic equipment with a Spectroline® leak detection flashlight. 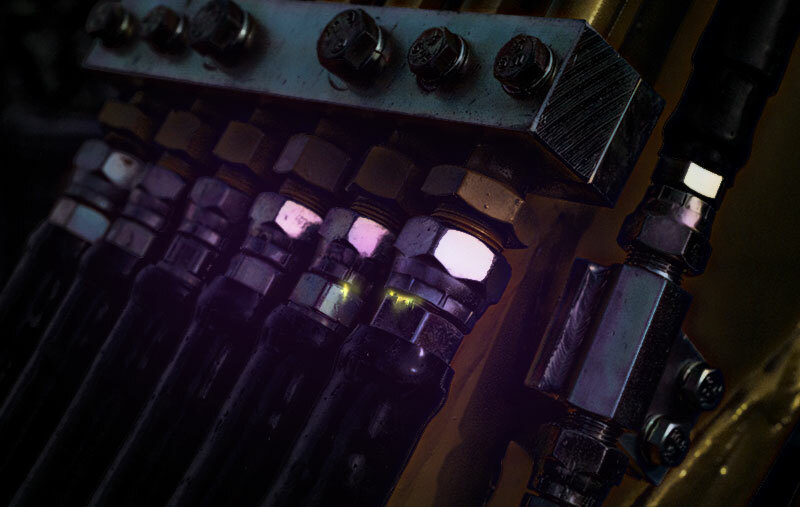 All leak areas glow brightly – allowing a technician to thoroughly diagnose leaking hydraulic systems. Once OIL-GLO® is added, it can remain indefinitely within the system. The dye continues circulating to provide 24/7 leak detection. Any future leaks that develop can be found – even at the smallest stages of leak development. This makes OIL-GLO® the perfect tool for preventative maintenance. 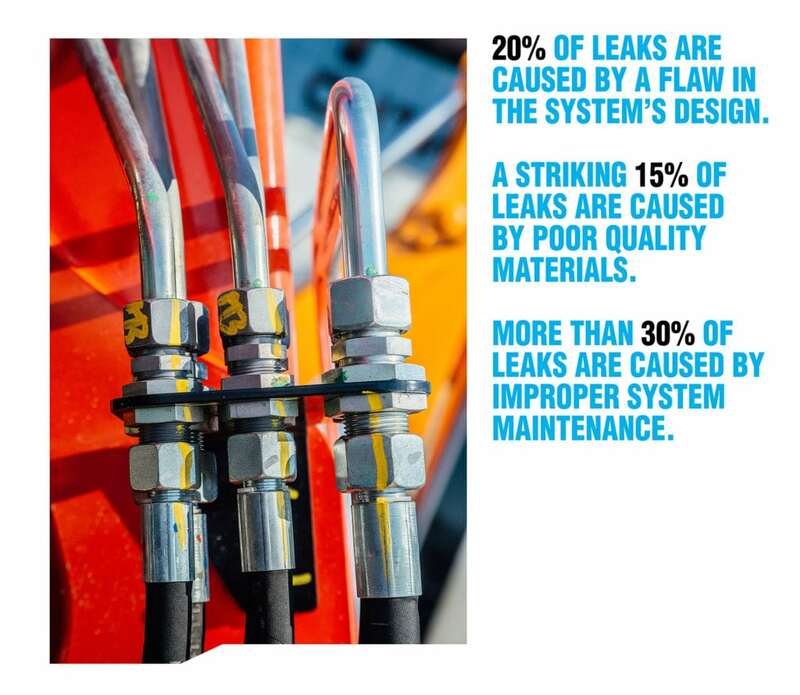 Plant managers can save time repairing leaks and ultimately extend the service life of their equipment. What Happens When Hydraulic Fluid Leaks Occur? Industrial equipment – such as excavators, cranes, and mining tools – require hydraulic fluid to perform. Fluid leaks in these systems will lead to equipment failure. To avoid breakdowns, equipment must be regularly inspected. Hydraulic systems are comprised of many interdependent components. These parts include pumps, valves, hydraulic fluid, motors, hoses, filters, and cylinders. The delicate balancing act between these parts is what allows hydraulic equipment to perform heavy-duty tasks such as excavating, demolition, and manufacturing. If the proper operation of these parts is inhibited, then the equipment is at risk of damage and possibly complete mechanical failure. The Spectroline® method of ultraviolet leak detection is simple, noninvasive, and doesn’t void equipment warranties. OIL-GLO® can remain safely within the host system because it is engineered to meet manufacturers’ specifications. OIL-GLO® is manufactured with OEM-Grade materials and is 100% compatible with system designs. OIL-GLO® is environmentally safe and NSF certified. OIL-GLO® dyes meet NSF category codes HTX-2 and HX-2. Spectroline® dyes are trusted by industry leaders and are OEM-approved by many of the world’s leading manufacturers of hydraulic equipment – including Caterpillar®, General Electric®, and John Deere®. What’s the Cost of Leaking Hydraulic Fluid? The cost of lost operational fluid can rise into tens of thousands of dollars. Hydraulic systems quickly breakdown, overheat, and fail when there isn’t enough vital, operational fluid. When your equipment is stuck in the repair shop, it’s costing your company thousands of dollars. The cost of downtime includes indirect costs like wages and lost manhours. Going back over 30 years, industry researchers found that 10% of the equipment drives 90% of overall costs. This is primarily due to equipment downtime. Preventative maintenance plans help to reduce costs by inspecting, repairing, and maintaining equipment on a regular schedule. OIL-GLO® is the perfect preventative maintenance tool because it can be easily implemented into existing maintenance plans. In 2017, scheduled preventative maintenance reduced overall operating expenses by as much as 27% (with perfect execution). Spectroline® Industrial Highlight from Spectronics Corp on Vimeo. 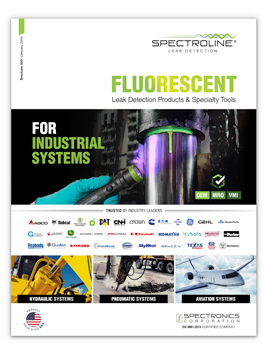 Fluorescent leak detection is an economical, effective, and easy to use preventative maintenance tool. Service technicians can scan equipment periodically to quickly find leaking hydraulic fluid. In 2017, our clients reported having a 23% reduction in new and/or persistent leaks. Fluorescent leak detection, combined with an executable preventative maintenance plan, saved hydraulic equipment operators thousands of dollars per unit (when leaking operational fluid was determined to be the cause of equipment failure).The total investment of implementing a preventative maintenance plan cost companies less than 1% of their total operating budget. After polling our clients, we’ve determined our product saved our customers an average of $800 dollars per year in lost hydraulic fluid alone (for medium-to-large sized hydraulic equipment). Our customers on average saved at least 15% on production and operating costs throughout the course of a year. Spectronics Corporation is the world’s leading manufacturer of ultraviolet equipment and fluorescent dyes. Their state-of-the-art products are built to exacting engineering standards and are utilized in hundreds of markets and applications that demand uncompromising quality and reliability. Spectroline® UV lamps and radiometers are widely used to verify the structural integrity of military and commercial aircraft. Spectroline® fluorescent dyes are used to check for fluid leaks in power plants, nuclear reactors, oil pipelines and industrial facilities worldwide, and were even used on the U.S. Space Shuttle.